This is a shameless self-promotion (I think that's ok...it is MY blog, afterall). After an epic battle with html, and with the support of Kristen at Ladybug here (for navigation buttons) and here (for centering), I get to announce some awesome upgrades! The Navigation Buttons above are fully customized (sweet!) and I have a Blog Button (double-sweet!)!! 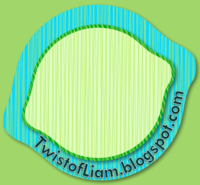 Now you can be the coolest kid on the block blog with your very own Twist of Liam Blog Button. Just imagine how cool you will be with such a vibrant addition to your page. To put it bluntly, please add my button to your page! Very nice button. :) Kristen is all kinds of amazing. but replace all the brackets with < and >. You might also want to change the URL to your own site...or leave it and keep sending people to my blog! I found this on Ladybug's Teacher Files in her video tutorial about adding the little symbols. Awesome, thanks! Also, I made a button, but I can't figure out how to do the text to paste. Is it a different gadget? Amy, if you email me at msk1ell(at)gmail(dot)com I can, later tonight, send you instructions for making the HTML code for your button. This gave me a hard time. Copy and Paste this code as a new html gadget (under your button). Replace my stuff with your stuff and the brackets with < and >. should be good as gold.